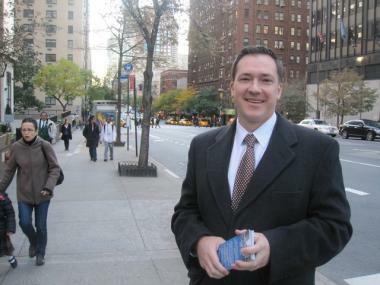 Paul Niehaus, 38, a Republican attorney campaigned Tuesday evening for the 73rd Assembly District. Niehaus faced off against incumbent Democrat Jonathan Bing for the seat. MIDTOWN EAST — After a bruising primary and a closer than expected vote against Republican challenger Paul Niehaus, incumbent Assemblyman Jonathan Bing pulled off reelection Tuesday. Bing had 64 percent of the vote to Niehaus' 35 percent with 94 percent of precincts reporting. Bing, who has represented the 73rd District since 2002, was battle-tested in the September primary battle against Gregg Lundahl, a spokesperson for the Bing campaign said. In the last legislative session, Bing passed a no-fault divorce law, brought select bus service to the East Side and saw the beginning of construction of the new P.S. 56. For some voters, Mayor Michael Bloomberg's endorsement of Bing in the earlier race against Lundahl was a deciding factor. "I like Bloomberg and Bloomberg did a big push for him," said Mary Ann Donohue, who said she backed Bing. Others said Bing's record as a liberal in the Assembly was enough for another term. "I voted straight Democrat," said Margo McKee, a resident of East 54th Street and First Avenue. Despite Democratic support in the district, a Republican upset would have had a precedent — Republican John Ravitz held the 73rd Assembly District Seat for 12 years prior to Bing's election. Niehaus, 38, an attorney who had never held public office, campaigned to reign in what he called an insane fiscal policy and restore integrity to the state assembly. "We have been surprised, throughout the campaign, at the anti-incumbent sentiment," Niehaus said as he did some last-minute canvassing Tuesday. Running in part to reform the MTA, Niehaus gained support from residents worried about further cuts to service. "It's completely outrageous that we've had a fare increase every year for three years," said Carolyn Mason, who campaigned for Niehaus for a week leading up to Election Day, of the MTA. "Everyone knows there's a lot of money that could be saved and service that could be restored and jobs could be restored," Mason said.